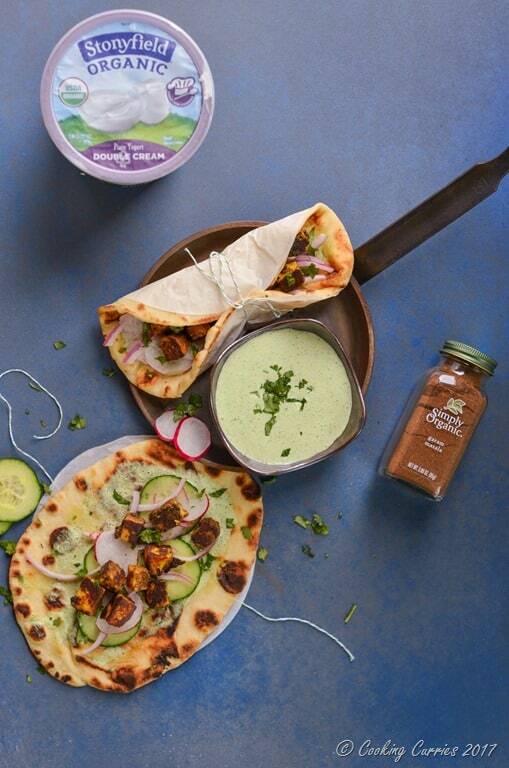 Yogurt and garam masala marinated paneer, that is sautéed and then wrapped in naan along with some spicy and tangy cilantro mint yogurt sauce and some pickled onions, cucumbers and radish along with more of the yogurt sauce for dipping – you know you want to dip that wrap and take a bite of it! A few weeks ago, you would have seen my post on Instagram about this new delicious Stonyfield Organic Double Cream yogurt and a box of incredible spices from Simply Organic that I received in the mail. All of a sudden, a lot of ideas came rushing in and I really had to work hard to filter some of them out. I picked Garam Masala from the spices I received and as you know there are so many recipes out there with garam masala and yogurt. But I wanted to make something different. A little out of the ordinary but still not totally out of the way and highlighting the beauty of Indian cooking. I opened the garam masala bottle and it had the fresh fragrance of all the spices in it and I really wanted to highlight that. And that Stonyfield Organic Double Cream yogurt is the most amazing – any whichever kind of yogurt you would have had. As the name suggests, it is so very creamy but also had a wonderful taste to it. It only hits the markets in February sometime, so you all will have to wait for it to get your hands on it. But please do not hesitate to grab one and put it in your cart, the moment you see it at a grocery store near you. I wanted to use the yogurt in the marinade for the paneer and also as a dip or a sauce so as for it not be lost in the marinade alone but also to be enjoyed as a nice and creamy dip. 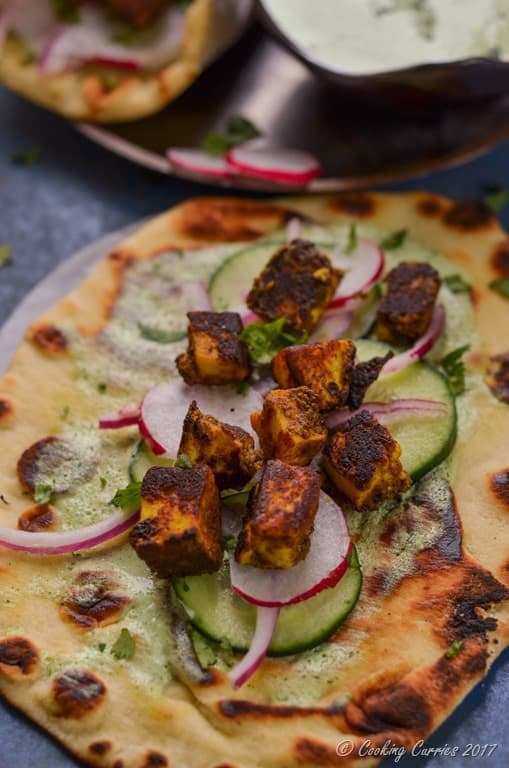 This is a very quick recipe with the paneer marinating for just 10 mins or so when you are prepping all the other ingredients. The onions are quickly pickled in some vinegar to give a different dimension of taste and the cucumbers and radish give some much needed crunch. The yogurt dip is made flavorful with some cilantro, mint and garlic and it balances out everything in the wrap. Lets quickly get to the recipe then. Sorry, you have to go through so many pictures, but I loved all these pictures and really couldn’t choose any to be left out without sharing with all of you. I hop/e you enjoy them. Marinated the paneer cubes in the yogurt, garam masala, turmeric powder, cayenne, salt and pepper for about 5 –10 mins. Meanwhile add the onion slices to the vinegar and keep aside. Also, add all the ingredients for the yogurt dipping sauce in a blender jar and blend to a creamy sauce. Heat the oil in a saute pan and saute the marinated paneer cubes, till all the marinade on all sides is cooked well. It is ok even if it chars a little. Heat up the naans on both sides on a skillet. 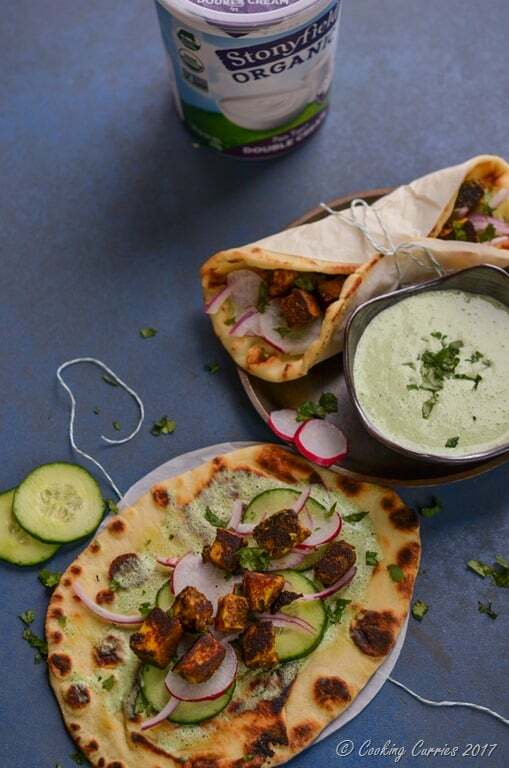 To assemble: Place a naan and spread some of the yogurt dipping sauce on it. Place some pickled onions slices on top of it and add half of the cucumber and radish slices. 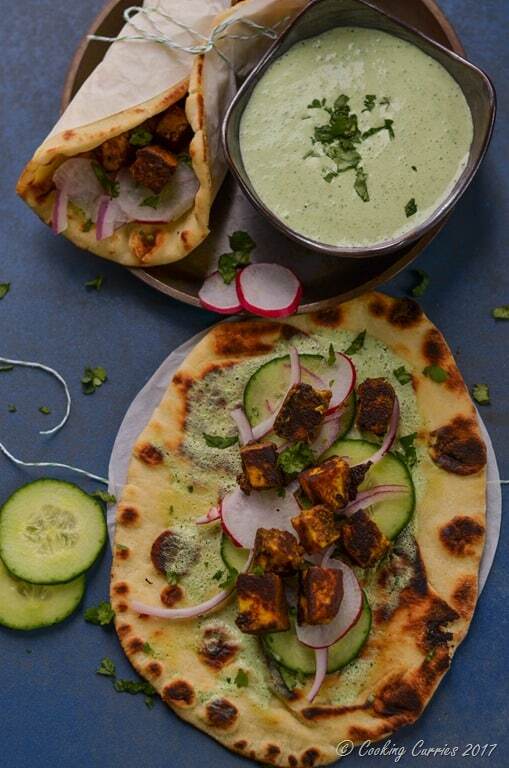 Top with half of the cooked paneer and fold the naan to form a wrap. Repeat with the other naan and serve the remaining sauce on the side to dip in. 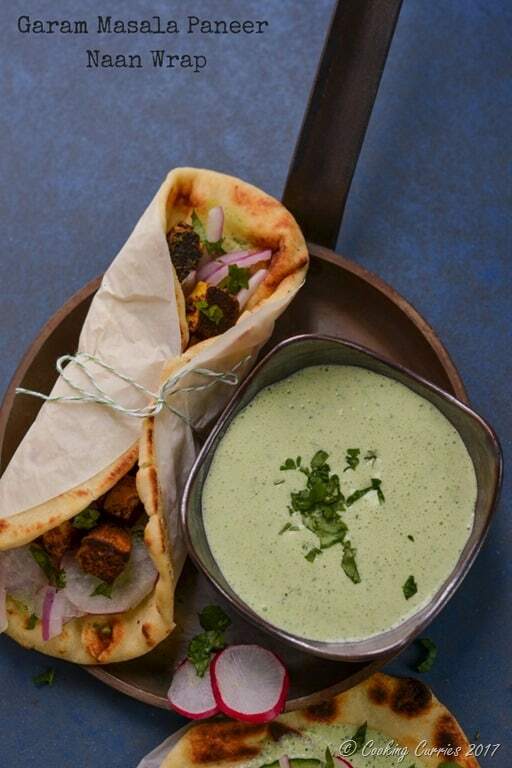 Naan makes for such a better wrap! Nice and hearty! It does, doesn’t it!? ? Oh yes please! Now why does my lunch or dinner never look like that? I need this in my life! Looks amazing! And that dipping sauce is making me drool. Looks delicious! Your photos are gorgeous! This recipe sounds delicious and that sauce, wow. I’d have to use a vegan sour cream, but still totally doable. Thanks for sharing. I have never worked with paneer before, but when I saw the word. “naan,” I was sold. Definitely something I would love to try!!! Paneer is really easy to work with. Requires little to no cooking, and you can rarely get it wrong. I hope you try it! Thanks! It sounds gorgeous! 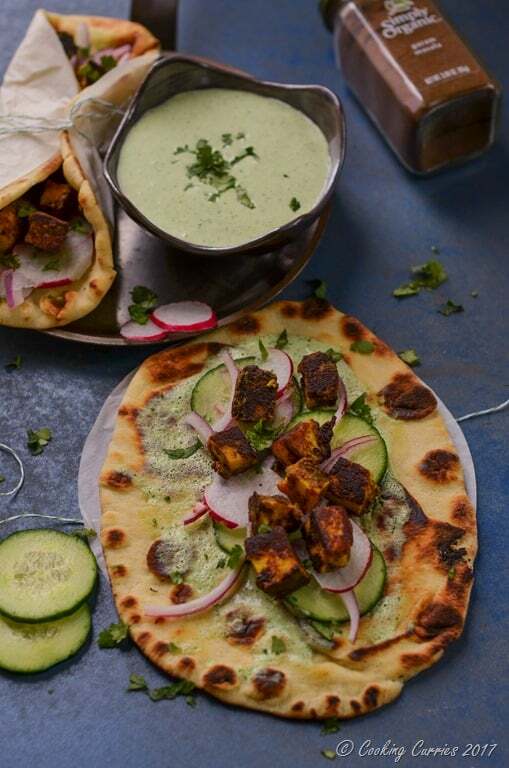 I love the sound of the herb filled yoghurt sauce and the paneer looks so beautifully cooked too! It’s always a good thing when you have too many ideas and have to work hard to filter them out, isn’t it? But I like where you ended up because this Naan wrap looks fantastic. And that dipping sauce. I could just dip everything in it. This looks delicious. My kids love paneer so I might try this, but cut down on the cayenne. Oh yes, you can totally skip it too as you are adding the garam Masala and there is a little heat coming from that as well. This looks totally amazing, love everything about this recipe and the beautiful photography. I the naan homemade? It looks wonderful. Off to check if you have a recipe for it here. Pinning. Thank you Jacqueline! This is not homemade naan though. I bought it from Whole Foods (we love those) The recipe for homemade Naan is yet to come! My mouth is actually watering reading this recipe! I love Paneer but haven’t used it in my cooking for far too long. Definitely going to give this a try – have pinned for later – love that it doesn’t need hours to marinate. Thanks! It doesn’t need a lot of time to marinate in this recipe as we cutting it in real small pieces, so the flavors will get in quicker. Also for most part, other than if you are grilling, you don’t need to marinate paneer for long or sometimes don’t even need to marinate. Oh my goodness, this sounds just amazing! I have been sick for the last week and haven’t been able to eat anything but the same soup over and over – this sounds like the perfect way to add some flavor back into my diet!! That’s good!! Hope you feel better soon! These look super tasty. Ive pinned the recipe to make later. This looks so yummy and easy! Love that it looks satisfying but still nice and light.